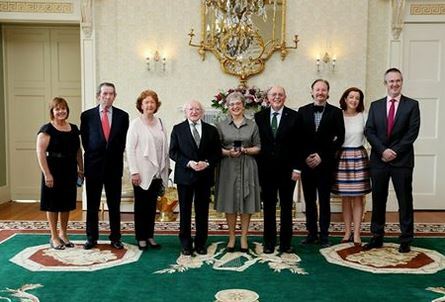 The Minister for Children and Youth Affairs, Dr Katherine Zappone, has received her Seal of Office from President Micheal D Higgins at Áras an Uachtaráin. Minister Zappone said her late spouse, Ann Louise Gilligan, would be immensely proud. Ann Louise passed away last Thursday morning, just hours after the Ministerial re-appointment was announced. “Family, friends and colleagues have been hugely supportive in recent days – and I want to acknowledge and thank all who offered their sympathy. I am overwhelmed and deeply grateful by the outpouring of support. Ann Louise was a fearless campaigner and would want me to continue our work for equality, fairness and justice. Following my reappointment I welcome the opportunity to continue the important work of ensuring that all Government policies are child centred. We must invest in future generations and that includes more cash and resources from Budget 2018. A radical new approach to childcare has begun. Families will benefit from an extra €19m this year, starting in September. It is a big step, but only the first step. If we are to have affordable accessible quality childcare then at the very least the increased funding already secured must be matched. This year €57m is going into clubs and activities for our young people. It is a 15% increase, but follows years of cutbacks. As Minister I will be arguing that we must see further rises to reverse the cuts in full. Through transitional justice the country is beginning to come to terms with dark chapters in our history. This work will continue. The process will at times be complex, difficult and uncomfortable but we owe it to survivors, families and future generations to confront and accept the truth.